Our kids are expected to grow up so fast. Psycho-social expectations, academic demands, and the digital universe all conspire to turn our kids into adults overnight. Sparring offers a counterpunch to that. Your child will learn important values, in a sport that is fun, healthy, and safe. In Kung Fu, sparring is a no-contact sport. We practice “point sparring,” which means kids are required to pull their punches and kicks. If they don’t, points are deducted, and students are disqualified for excessive force. Participants wear protective headgear, gloves, shoes, and other necessary protection to keep them safe. As with any physical activity, there is never a guarantee, but our injury rate is exceptionally low. 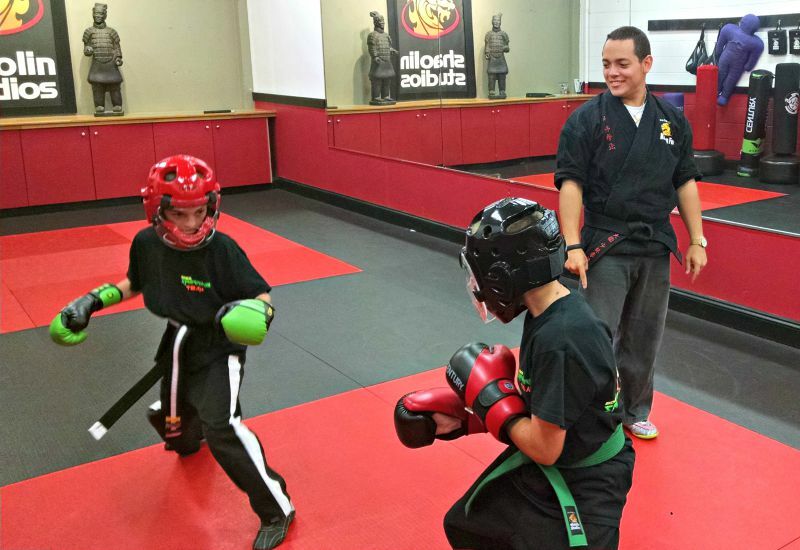 In sparring, students learn a healthy level of self-control. At first, the challenge is simply to score points without earning a penalty. Then, as the challenge grows, students have to keep their cool when frustrated. Sparring also requires a high level of eye-hand (and eye-leg) coordination, and agility. Finally, kids discover the courage to stand in close range with an opponent who is trying just as hard to score points on you. Life will bring challenges, bullies, and difficult people. Sparring helps build the strength to face all that. This generation has the biggest weight and fitness problems in our nation’s history. Sparring is an anaerobic activity that builds tremendous cardio-vascular health. Students run, jump, and move in irregular bursts. Adrenaline often carries them farther than they ever expected. This type of activity improves heart health, reduces blood pressure, builds stamina, and improves focus. Finally, sparring is just plain fun. Students are closely monitored and carefully coached. We mix all sorts of drills, games, and challenges in with regular sparring, to build skills and keep things exciting. Kids learn respect and sportsmanship. It is not uncommon to see two students laughing and sharing a “bro-hug” after a particularly tough match. We can’t change what the world expects of our kids, but we can get them ready to face it. We can help them learn the self-control and courage that it takes to succeed. Sparring is one of those rare activities that give a kid the chance to be a fun-loving kid, and still grow up a little bit, all at once.